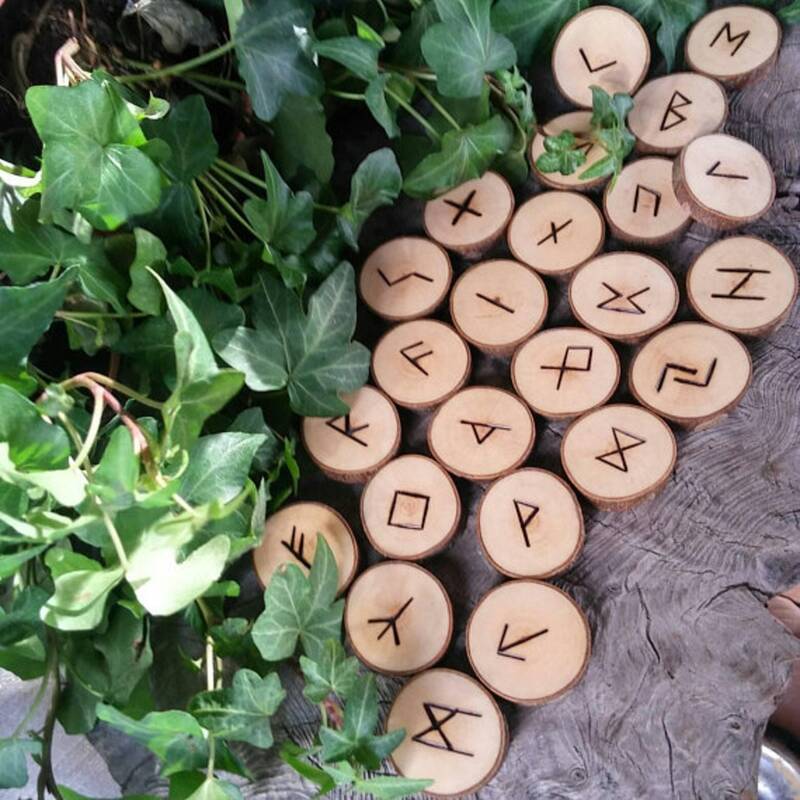 A set of wooden runes, the runic alphabet created by Odin, the Norse god. 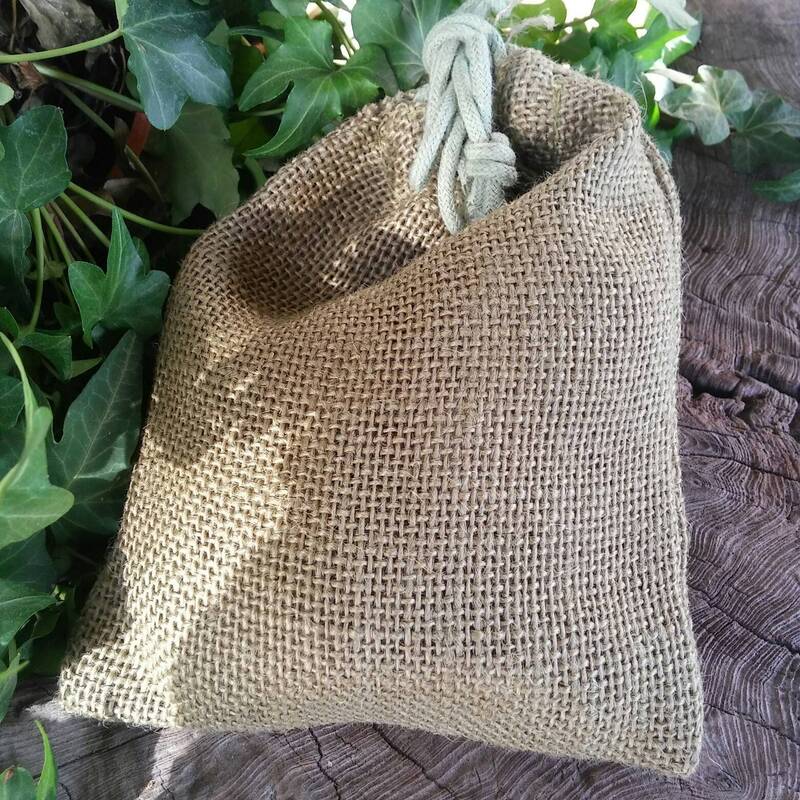 This set of Elder futhark runes includes a green Hessian drawstring bag but NO box. 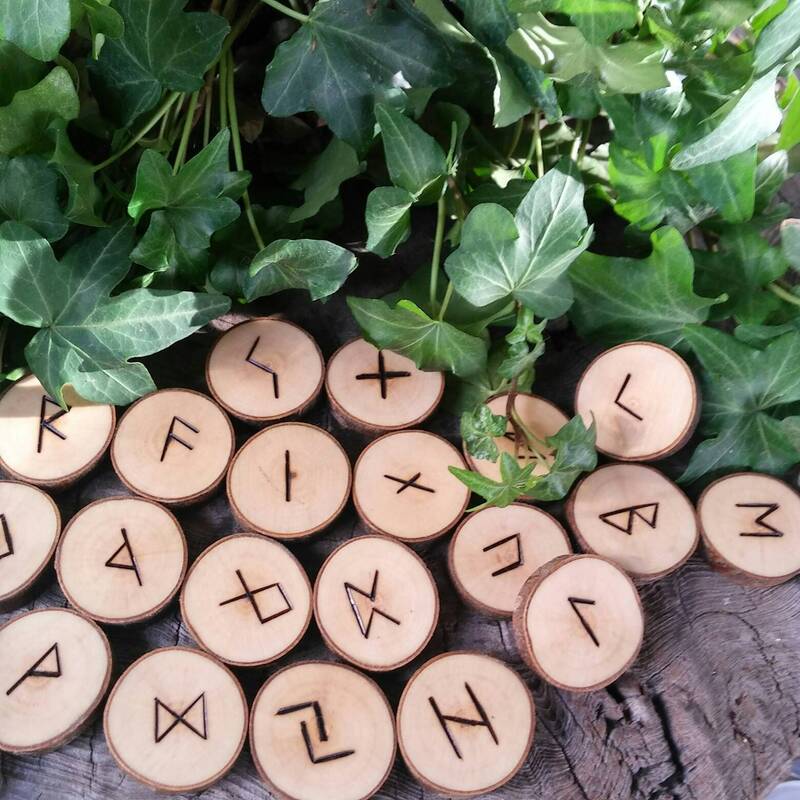 They are Maple runes for divination. 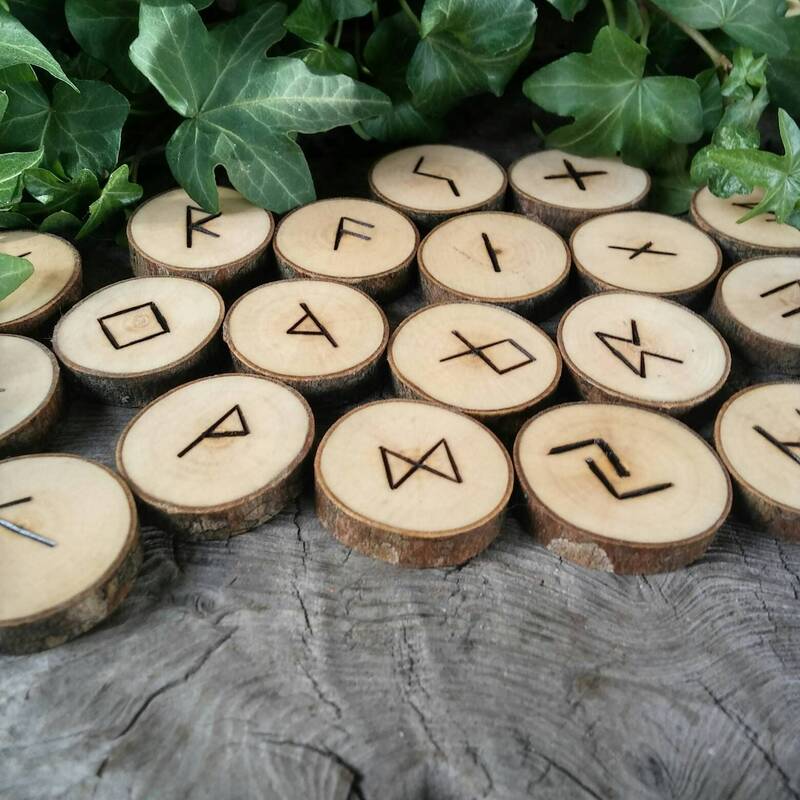 The Maple wood runes are sanded smooth and pyrographed. They are often called either Viking runes or Norse runes. This rune set is the Elder Futhark alphabet, not the Anglo-Saxon alphabet which is similar but different. 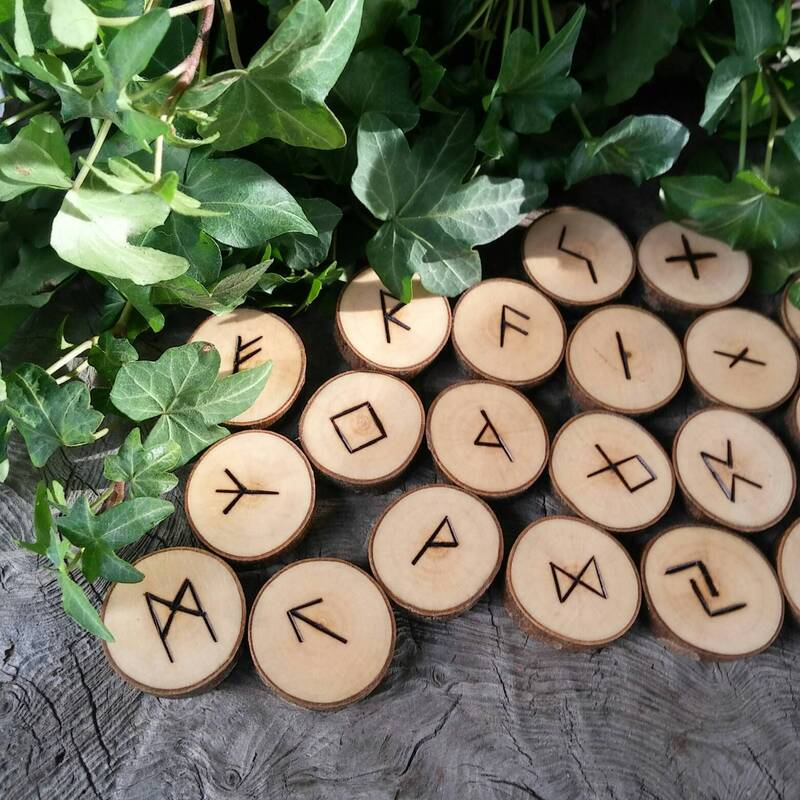 The runes are about 1 inch in diameter, lightly hand sanded, and pyrographed with the Elder Futhark marks. They are made from Maple wood and the bark has been left intact. I chose Maple for these runes because of their balance in all matters. They have been sanded smooth and rubbed with mineral oil for protection which you can do from time to time as you see necessary or you can also use our own Speaking of Witch Wands Beeswax Wand Polish. I do not send instructions, however, I will send the link to a trusted website where you can download the runes book for free. There are 24 runes. If you wish to also receive a blank (some people like to use a blank) let me know at the time of ordering please. Maple trees holds the wisdom of balance, magickal promise, and practical magick. Maple has both Feminine and Masculine energy. Libra and Virgo consider this tree to be sacred. Associated with the elements of Spirit and Water. The great horned owl is the sacred bird of this tree. Magickal Properties: Some cultures primarily use Maple wands for spiritual healing. Maple is a traveller's wood. It enhances intellectual pursuits, acquiring knowledge, and communication. Spells concerning art, beauty, binding, and abundance should consider using this wood. The gypsies believe Maple brings gold and that eating the seeds draws love.. Maple is mostly feminine in nature and associated with the moon and Jupiter and the elemental energies of water. Maple is excellent for wands, staffs and maypoles. Maple is useful in moon magic and in spells related to travel, learning and decision-making, especially in matters related bringing about or dealing with change. Maple is also useful for spiritual healing. Maple syrup may be used in Kitchen Witchery for love spells and spiritual healing, i.e. soothing the psyche. Please be sure to cleanse and consecrate these runes as they should be before use. And, please use responsibly. 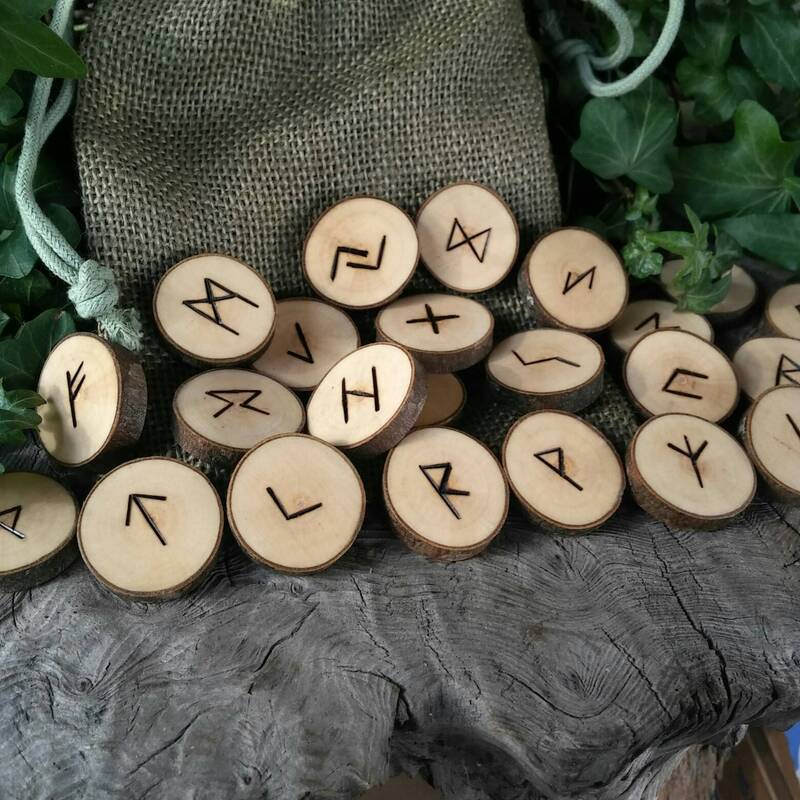 Please visit our Runes section http://etsy.me/1rSQPUt for our full range of Elder Futhark Runes.